Drivers and software updates are very critical to keep system in good shape. We have already seen applications that help you backup drivers for future use. While backup is important, drivers and software updates is more important. Microsoft update Catalog service is one stop place for all drivers, updates, hotfixes for your Windows based computer. It’s a service from Microsoft that provides a listing of updates that can be distributed over a corporate network. Updates are released once a month. To get started click here and install activeX file and your are good to go. 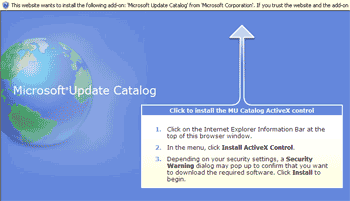 Read FAQs of Microsoft update Catalog to know finer details of this service. In case you are looking for specific driver of a device on the computer, thenÂ check NoDevice.